"The Hobbit: The Battle of the Five Armies” brings to an epic conclusion the adventure of Bilbo Baggins (Martin Freeman), Thorin Oakenshield (Richard Armitage) and the Company of Dwarves. The Dwarves of Erebor have reclaimed the vast wealth of their homeland, but now must face the consequences of having unleashed the terrifying Dragon, Smaug, upon the defenseless men, women and children of Lake-town. I loved the first 2 movies so I was excited to receive this one to review. If you are a fan of The Hobbit book or the previous 2 movies you will most likely enjoy this one. I thought it was well made and action packed that I just couldn't stop watching. 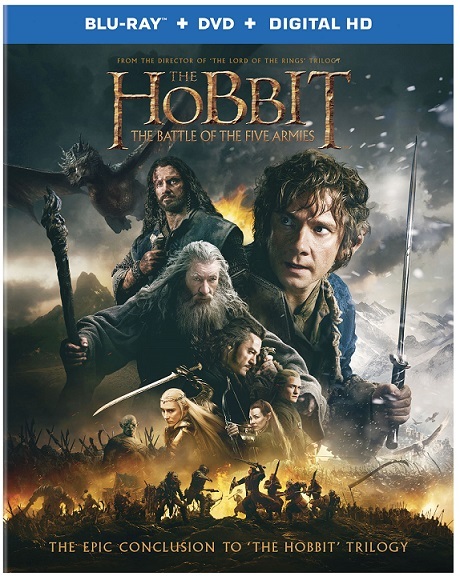 The Hobbit: The Battle of the Five Armies comes out on DVD and Blu-ray March 24th 2015.